The twinkle in the eyes of children of Hapti, a beautiful village in lap of Himalayas, can't wait for sunrise to be seen. Solar panels and solar microgrid are coming to conquer the darkness of their lives by lighting up the village. In Aug 2017, I plan to help illuminate remote village of Hapti near Leh, which is two days’ trek from nearest town. Along with other volunteers, I will light the centuries old remotest village, ending eons of darkness, by setting up solar panels, erecting iron poles for the wires and layout battery packs. The installed grid would be inaugurated by local villagers. I am part of Global Himalayan Expeditions (GHE) 2017, which strives to bring safe, reliable and affordable electricity to remote mountain villages and communities in India's Kargil and Ladakh provinces that date back centuries. Making use of DC solar- energy storage microgrid technology developed in collaboration with the Indian Institute of Technology (IIT) GHE has installed 95 highly efficient DC solar-energy storage microgrids (total 19.6 kW) in 22 villages since it launched its non-profit electrification program in 2014, including 2,000 LED light bulbs, 60 LED street lights and 36 LED TVs. An IEEE Global Partner, GHE draws on the talent and skills of an IIT technical team in designing, engineering and installing its DC solar-storage microgrids, as well as LED lighting it manufactures. GHE's DC solar-energy storage microgrids are improving the lives, and livelihoods, of some 5,130 Himalayan community residents and counting. More than half are female. The emissions-free electricity generated, stored and distributed by GHE's microgrids is also reducing the money villagers spend on kerosene — about 63 tones worth annually. That's reducing the villages' annual carbon gas emissions by 157 tons. GHE has also trained 35 villagers as entry-level solar technicians — creating green jobs and greatly increasing the likelihood the village solar-energy storage microgrids will continue to operate and perform well for many years. GHE has also set up two education centers and an E-Base online distance learning program that promote experiential education with curricula that revolve around themes of sustainable living and commercial enterprise, benefitting 1,200 students. It has created 15 mountain home-stays that are now electrified, benefiting villagers and trekkers alike. To date, that has boosted the income villagers earn from tourism by approximately $24,000. Funds will go to GHE which will provide solar micro grid, panels, bulbs etc. as well as cover travel cost, getting travel gears and associated expenses. I am happy to report that we successfully installed 3 microgrids in village of Hipti near Leh, J&K. 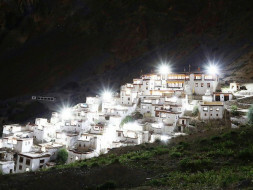 This lighted homes of around 75 villagers, besides a school and a monastery. We also contributed a solar TV with cable connection for their community hall. The local councilor said that the day was a bigger festival than their new year celebrations. However It was the face of villagers which gave it all (pictures attached). 8 members of Singapore TV Channel 5 came with drones and other shooting equipment to cover the electrification of Hipti village. The episode would be aired in Jan 2017. I am also planning to write about it in Sep/ Oct 2017 in my blog at a Health and Wellness startup. I am happy to share with all that we have raised Rs 43,750 till date. Considering that we raised 90% of this in first 14 days is really exciting. My post on this topic has 1514 views including 52 from C suite executives. So people are definitely looking! I am going to climb Mt. Everest base camp today onwards. So my engagement will be dependent on mobile network along climb route. So may be I will extend the dates of this campaign. I am sure together we will achieve the target. Can't thank you all enough for the support.